The former “Sabrina, the Teenage Witch” star spent a good portion of Friday — the 14th anniversary of the September 11th terrorist attacks — complaining on Twitter about the coverage of the tragedy on cable news. Hart wasn’t done there. She went on to suggest that the networks had let down her kids. In the face of cable news’ apparently inadequate coverage of the anniversary, Hart provided further commentary, reposting an Instagram message from the Got Your 6 campaign, which unites the entertainment industry with veterans nonprofits. 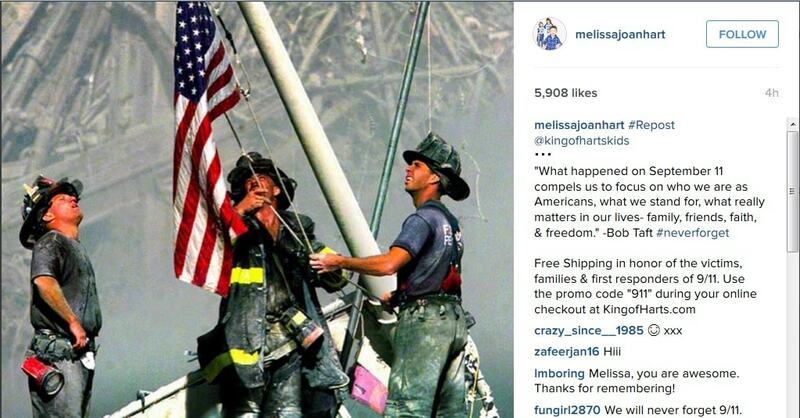 After lambasting the news media for not properly remembering the national tragedy of Sept. 11, 2001, Hart worked in a plug for her company, King of Harts, noting that the clothing line is offering free shipping in honor of those who had been affected by the attacks. God bless America — and commerce.